You’ll notice a new Meta Options box in the Menus Control Panel. 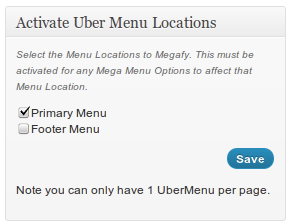 This panel determines whether a particular menu location will be megafied. The location of your menu must be activated in order to megafy the menu. This allows you to have certain one location megafied while others remain normal menus. Please note that you can only have one Mega Menu per page. You could have 2 mega menus, but only if they never occur on the same page.